Arkadiy Kots is the Moscow based folk-punk band. Their practices are based on the translation of the international riot classics bringing them into contemporary Russian-speaking context. Nikolay Oleynikov is an artist, who works with several artistic collectives such as Chto Delat and Learning Film Group, he also performs with Arkadiy Kots band. 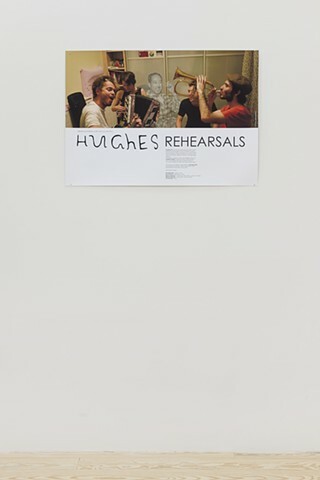 The sound-piece made for WRC show in New York was developed during one of the band’s recent rehearsals when they were developing a new series of songs based on poems by Langston Hughes (1902-1967). Hughes as one of the leading American communist authors was widely translated in USSR, but his gay identity was never announced back then. The process of the rehearsal of the band reminds a scene from Jean-Luc Gorard’s “Sympathy to the Devil”(1968). Piece also refers to the tradition of Soviet dissident intelligentsia to have poetry readings and having talks about politics and arts at the communal kitchen at night.